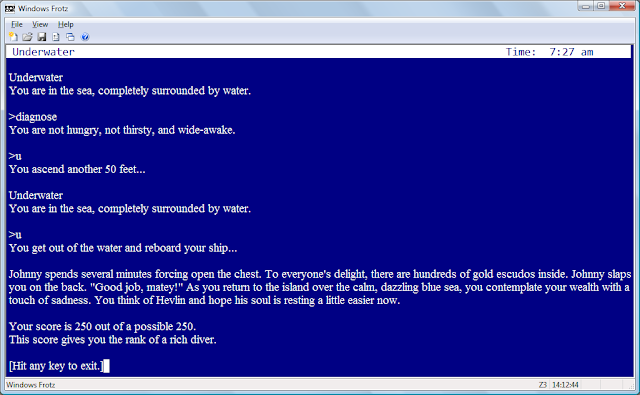 This week, we're playing through a 1984 Infocom text adventure, a seafaring tale that's miles from Pirate's Isle or Monkey Island -- Cutthroats, created by Michael Berlyn (Oo-Topos, Infidel) and Jerry Wolper. Cutthroats was the second game in the short-lived Tales of Adventure series (Infidel being the first); it takes place on and around the fictional Hardscrabble Island, and despite the title it has more to do with treasure hunting and salvage than anything piratey. 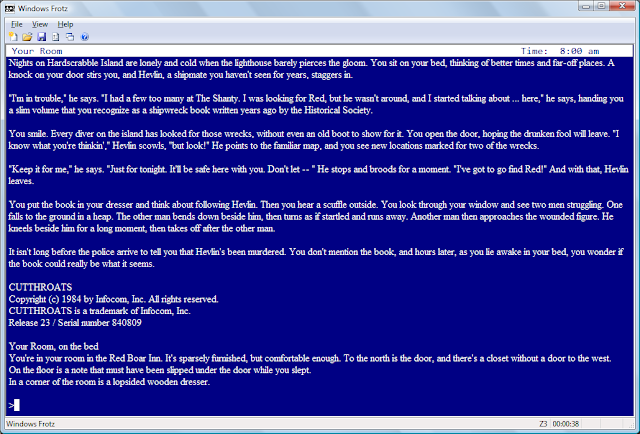 It's regarded today as one of the minor Infocom efforts -- it's more linear than some of the classics, and the copy protection is more intrusive than usual. Also, while there is substantial replay value built-in, it's not necessarily apparent to the player and I'd guess most people who have finished the game missed a good chunk of its content. The story opens late at night, as a drunken acquaintance named Hevlin staggers into the player's room at the Red Boar Inn, leaving us with a slim shipwreck book for safekeeping; it has new locations marked for two long-coveted wrecks. Of course, shortly after he leaves he is attacked and killed; the police arrive to tell us this, and then leave us alone, sitting on the bed, dismayed but apparently free of official suspicion. As the game gets underway, our first order of business is to reexamine Hevlin's book, which we casually slid into a dresser drawer during the night, and read a note apparently slipped under the door later on. The note says, "If you're interested in a big deal, be at The Shanty at 8:30 this morning -- Johnny." We can check the status bar for the time, or our own watch -- in my playthrough, it was 8:05 AM at this point. Each turn consumes one minute on the clock, so we need to move quickly. The dresser also contains a Mariners' Trust passbook (we have $603 in the bank, presumably to supplement the $20 in our pocket), a room key, and some clothes we won't be needing. The shipwreck book is itself included in the original packaging, or on the Internet these days. The closet contains diving gear for shallower waters -- a wet suit, air tank, diving mask and a pair of flippers. At 8:20 AM, the Weasel walks in to see if we're coming to the meeting. We start getting hungry and thirsty, but time's a-wasting so it makes sense to follow Weasel, since we haven't had a chance to map the world out and find The Shanty, an establishment with which we are clearly supposed to be familiar. It's probably good to lock the door to our room before we head out -- in my playthrough, I'm carrying the shipwreck book and am now wondering if that's a good idea, but we'll see what happens. The walk gives us a brief tour of this seafaring town, but there isn't time to explore. Fortunately (or so I thought), the clock seems to freeze for a while as we make the journey. The Shanty is a seedy, dirty bar; the bartender polishes glasses, and the Weasel picks his teeth with a knife. A parrot with an eyepatch apparently belongs to the bartender; a man sporting similar gear named Pete the Rat is also present, and our motley crew's leader Johnny Red says, "Sit down and we'll talk." He repeats this if we spend time doing anything else, so it's probably wise to SIT DOWN. He whispers something about buried treasure. Hunger is beginning to overtake our character, so we can ORDER A MEAL for a non-negotiable $5. Johnny indicates that money is needed to fund the expedition, and we're chosen because we're a great diver... and, of course, because we have some cash salted away. JOHNNY, NO seems like the wiser choice at the moment, though I'll probably regret it -- "We'll find someone else," he says, and then ignores us. It's too late for a JOHNNY, YES; clearly a restart is called for, but we might as well map out the area a bit before we dive back into the narrative from the beginning. An alley runs behind the establishments on the south side of Wharf Road, which may be useful to know. An abandoned field borders the alley to the south, but "You can't get through the weeds," so it doesn't appear we'll be doing anything interesting there so this is just a way of bordering the town map without being too obvious about it. We can enter McGinty's Salvage Office through a window from the back alley, but if we go north again into the Wharf Road, we can't reenter because it is closed. We need to do this early in the game, as McGinty eventually comes back and shoots us as an intruder (which, in truth, we probably are.) This was my first death, with 0 points out of a 250, ranked as a "chicken of the sea." And my second death, too, as if we don't stop in at the Shanty before trying his window, McGinty also catches us trying to sneak in. Leaving the Red Boar with plenty of time to reach the Shanty, I try to GIVE THE ROOM KEY TO THE CLERK, but he won't accept it; "You've paid for another week." There's a lighthouse to the southwest, locked of course, and the geography is as odd as usual for an adventure game; we can't seem to get into the back alley from this side of the Red Boar. At the Shanty again, JOHNNY, YES commits us to a second appointment at the lighthouse at 9:30; McGinty, we are warned, is not to find out about this. The ocean road runs north-south along the east side of town, and leads to a couple of other roads -- the Shore Road to the southwest, and a narrow path that leads up higher to Point Lookout, affording a view of the ocean. It's choppy today. The Shore Road leads to a ferry landing, with a ferry to the mainland running every two hours. We can't board the ferry, as we don't have a token, and there doesn't appear to be any place to purchase one. Back in town, some establishments are now open for business. We can visit Outfitters International where a salesman and a price list offer various supplies (again, the price list is in the package, as a bit of copy protection.) Available supplies include flashlights, nautical charts, tubes of putty, nets, spear guns, and lots of other paraphernalia... but we don't have a clue as to what equipment we might actually need at this early stage of the game. McGinty is also open for business, and it's not wise to betray Johnny and SHOW THE BOOK TO MCGINTY -- he's pretty trigger-happy, as he simply shoots us to get at the info. I'm beginning to suspect he will be our primary obstacle. If we stop in to his establishment with Hevlin's shipwreck book in our possession, or even run into him in town, he seems to notice, and follows us out of town, so perhaps we should just avoid him at this stage. Getting into McGinty's office when he's not there is simply a matter of LOOKing THROUGH THE WINDOW until we see his office, but don't see McGinty sitting at his desk. We can't open his locked desk or smash it, and there are no other details here of interest; nothing on the desk, nothing on the floor or walls. So whatever we might have to do here, it's too early to do it now. The town's wharf, on the north side, currently hosts a trawler named the Night Wind and a deep-sea salvage ship called the Mary Margaret. The Mary Margaret is fairly large, and while we can navigate with N/S/E/W it makes more nautical sense to work in terms of AFT, PORT and STARBOARD. The ship's wheelhouse is dominated by a large air compressor, presumably for diving. Below the Fore Deck is the Crew's Quarters, a cramped collection of bunks. The Night Wind on the other side of the wharf is almost identical in structure, so perhaps we will have to make a choice as to which craft to take on our salvage trip. This ship lacks an air compressor, so it's likely not as suitable for diving. The lighthouse door provides four brief lines of credits -- "This lighthouse is part of / CUTTHROATS / an Infocom Tale of Adventure / by Michael Berlyn and Jerry Wolper / (c) 1984 Infocom, Inc." The Shanty's parrot is for comic relief -- if we listen to him, he "would gladly accept a hard biscuit today, if you would accept payment Tuesday." And he'll say "Hello Sailor" too. Converging on the lighthouse, if McGinty has spotted us, he follows us toward the meeting, which proves fatal as the others assume we have tipped him off intentionally. If we avoid that situation, then Pete, the Weasel and Johnny Red turn up on schedule. In my playthrough (this can vary randomly between two very separate scenarios), Johnny shows off a Portuguese coin circa 1680, and says we're not sure which of the two wrecks marked on the map to salvage. Johnny asks us to decide and provide him the shipwreck's location, expressed in minutes of longitude and latitude, and bring $500 to meet him at Point Lookout at 10:45. Then we'll all meet at the Shanty at 11:45. Johnny will captain, Pete will cook, the Weasel will crew, and we will dive. So it's off to the bank to pull $500. In a rare challenge for the reliable Infocom parser, we can't WRITE A CHECK or CASH A CHECK (CHECK is recognized as a verb only) but we can WITHDRAW $500. Actually, it's a passbook, not a checkbook, so I was on the wrong track anyway. The ferry happens to pull in at 10:00, but we have no business with it, and we're feeling thirsty again, so we'd better stop into the Shanty for a drink. And now it's almost time to meet Johnny. While we're waiting, we can see McGinty from a distance wandering down to the ferry landing or the bank, but he doesn't see us. When Johnny arrives, he wants to see the money -- JOHNNY, YES to his "Did you bring the money?" is not sufficient, but SHOW JOHNNY THE MONEY gets him into a good mood. Cutthroats has a weakness compared to most of the Infocom games -- it's very linear, and the copy protection is a little too intrusive. Here, we need to decide which boat to take by seeing if the treasure is more than 200 feet deep. This we do by referencing the pack-in documentation, which, while a practical puzzle of sorts, makes this feel more like a chore or a guide than an actual game task. We can see that the two newly-marked shipwreck locations refer to the S.S. Leviathan and the Sao Vera -- given the Portuguese coin and its date in my playthrough, it seems we should check out the Sao Vera as the most likely candidate. It's at 45 degrees longitude, 40 degrees latitude, and the topographical map shows it's at 400 feet deep. So the Mary Margaret it is, then. Now we're off to provision the boat -- except we run into McGinty at the outfitters, and he again does a double-take looking at our possessions. I tried hiding the book in our room back at the Red Boar Inn, but he still reacts the same way, so maybe he's just noticing that we're clearly going diving. If we buy something at the store while McGinty is there, such as shark repellent, he figures out something is up and rents the necessary boat out from under us. Can we wait until he leaves to conduct our business? LISTEN TO JOHNNY suggests that -- "Let's wait out McGinty. He should leave soon." But he doesn't, actually, and as the 11:45 meeting draws near Johnny gives up on the whole thing, ending the story. Trying to lead McGinty out doesn't work -- once he's seen our possessions, he sticks close, so when we reenter the shop Johnny's conversation with the salesman is interrupted. We have to limit our inventory to avoid this problem, but he's a nosy and greedy fellow -- only the watch and the room key don't seem to trigger McGinty's suspicions. If we're suitably "clean", then McGinty leaves by 11:07 AM and we have time to do our own provisioning. We have to chip in $441 plus money for our own stuff, which apparently means we have about $59 to spend ourselves, though we can withdraw a little bit of extra money from the bank. Whatever our budget in hand, we have to PAY $441 before we can do our own shopping. We're scheduled to depart half an hour before high tide, but reading that from the packed-in chart requires knowing today's date. The hotel clerk will give us the time, but the parser doesn't recognize the word DATE. So we'd better just be quick with the remainder of our preparations, I guess, and be ready to wait around for a while if need be. We can learn a few things by trial and error when deciding what to buy, although we can't return things; the diving book is a waste, as it says nothing you don't already know. I opted to buy the flashlight, a dry cell, tube of putty, "C" battery, net, and shark repellent. The store is out of stock on the spear gun and compass, so maybe these are the right things to buy; everything else is out of our price range, it seems. The Outfitters International delivery boy shows up dockside at about 1:45 AM, and if we follow him we get a tour of the Mary Margaret. This was useful, as I had missed the passage down from the Aft Deck to the Lounge and Galley areas; finally, our supplies are left in the Storage Locker and the delivery boy departs. I'm concerned that our air tank is still empty, but the deep-see diving suit and air compressor may be all we need. Johnny shows up at 2:30 AM and needs the latitude and longitude information. JOHNNY, LATITUDE IS 40 and JOHNNY, LONGITUDE IS 45 communicate successfully. We're advised to get some sleep, though the game is a little inconsistent here; at one moment, your mind is too active to let you sleep, but a few minutes later, In no time, the rhythm of the ocean lulls you to sleep. Johnny wakes us up at 5:59 AM. "You're up as soon as you're ready," he says, So we'd better get ready. The SWANZO BRAND SHARK REPELLENT has a label advising us that it will work for five hours and must be opened underwater, as the fumes above the surface may be hazardous. We're also getting hungry again. A small machine has a worn, unreadable label, but takes a dry cell; if we turn it on, it clicks slowly. Is it a Geiger counter? We can eat stew and drink some water in the Galley. On the Aft Deck, the Weasel tosses an orange line over the side; we're to tie it to the treasure, and then pull on it to signal the crew onboard can pull it up. I'm not sure I'm comfortable with this arrangement, but it seems we have no say in the operation. Trying to connect the deep-sea diving suit to the compressor is a problem, because there's no hose here. Backtracking to check confirms that we can't buy any at the Outfitters International store. Ah - I was looking at the compressor from inside the wheelhouse. On the Aft Deck we can see that it has a retractable air hose built in. Once we're in the water with the compressor running, we can't TAKE LINE -- You can't reach the line. Worry about it when you've found the treasure. Fair enough. Diving down one step, to 50 feet, it's now too dark to see. We can TURN ON FLASHLIGHT, just in time to see a shark as it swims up to you and starts nibbling. So we ought to use the repellent before we dive too far. Fortunately, the Mary Margaret is very precisely anchored, and all we have to do is dive straight down until we reach the rotting shipwreck's Top Deck. The aft end of the Middle Deck has a doorway, blocked by fallen bunks that we can't move. A cask that is still in one piece is in the Galley, and a wall plaque confirms that this is indeed the Sao Vera. There's a rope wrapped around the lower part of the fore mast; is that our rope? We can't quite reach it from the middle deck, and if we try to climb up, the centuries-old ladder collapses. Actually, we can't climb up at the other end either -- so we probably should have freed the rope when we first got here. Ack... except, no, we can't access it from above either. Maybe it's just a rope that's part of the ship, distinct from the line we'll be looking for later; this is indeed the case. The tube of putty we brought along is Frobizz waterproof putty. Might come in handy. The cask is confusing -- we can't open it, as it's already open, but if we try to look inside the cask, There's nothing on the wooden cask. So it's not really a container? Is it the treasure? If we don't enter the ship at all but come back up to the Mary Margaret, it's now grown too late for another dive and the game ends with disappointment. If we DROP EVERYTHING in an attempt to lighten our load enough to swim up from the Sao Vera's middle deck, we also drop the suit and drown; if we drop everything but the suit, eventually we run into something in the darkness that seems to be an aquatic grue. There are some iron bars below deck that were probably used as pikes; throwing and poking a bar at things doesn't seem to do anything. The bunks at the aft end of the Middle Deck remain unmovable, though they are blocking a doorway that ought to be interesting to explore. Well, another old Infocom tradition is the Invisiclues, and I seem to be in need of a hint here. And yes, they suggest that we need to move the bunks, and the next level of detail suggests we need a lever. The iron bar ought to work for that (I have to remember to picture these iron bars as pikes and not rectangles) -- MOVE BUNKS WITH BAR was not intuitive for me, but does the trick. Next, as we move aft, the row of bunks starts to fall, threatening to pinch the airhose if we've gone through the passage. If we stay near the bunks, they fall and we can move them again, but they continue to fall every time. Could we secure them with the rope? We still can't acquire the rope. There's just time to explore below decks and discover a giant squid sleeping in a lower cabin before the airhose gets cut off by the collapsing pile of bunks. So we need to secure the bunks somehow. I tried to JAM BAR BETWEEN BUNKS AND FLOOR and INSERT BAR BETWEEN BUNKS AND WALL to hold them in place, to no avail. But PUT THE BAR UNDER THE BUNKS works -- thanks again, Invisiclues! Now the iron bar is wedging the bunks up, and we can go further below decks -- this ladder is more usable than the other. We can, of course, get killed by the giant squid as its tentacles envelop us and disconnect the airhose. THROW NET OVER SQUID doesn't do any good, it just slides off. But we can just bypass the squid if we move quickly past and avoid waking it up. The Below Decks area contains an oak chest, and a lounge area with about fifty skeletons of the Sao Vera's unfortunate crew. One has a scabbard on its hip, with a sword that may come in handy. There's also a maple chest at the forward end of the ship. We can't open either chest, so it may be a 50/50 chance as to which one we salvage. Both have convenient holes in the hull nearby, and if we swim through the holes we can catch the orange salvage line from above swinging through. But in both locations, The orange line isn't long enough to take with you. Dang. And we can't PUSH CHEST THROUGH HOLE either. We can't KILL SQUID WITH SWORD. And we can't explore outside the ship, as our airhose trails along through the hole and tends to get caught and torn. Can we draw more of the line down from above? DRAW LINE doesn't work, nor does CUT LINE WITH SWORD, though I don't know why we'd want to do that. And again, we are running out of air. We can't fix the broken ladder with the waterproof putty, unfortunately, despite the rung remnants lying about. I was disappointed when I found out just why I needed the Invisiclues again -- while PUSH CHEST THROUGH HOLE yields You don't have the oak chest, PUSH CHEST TO THE WEST works!!! (We can similarly PUSH MAPLE CHEST TO PORT.) Now we can TIE LINE TO CHEST and send one of the chests upwards, though I don't know which is the right one at this point so I'll keep a save handy at the decision point. Trying to swim back up to the Mary Margaret runs into an old problem -- even though the lower ladder is relatively sturdy, the bottom rungs are broken and You can't reach high enough to get past the two broken rungs. The cask from the middle deck can't be moved down here, so maybe we can push the remaining chest down to the aft end of the ship. That works -- we can climb onto the chest and then climb the ladder. Now we're back to the other ladder, where we now know we can push the cask aft to make the hole accessible. Except, no, this hole is still unreachable -- too high, and there's no usable ladder here -- so we'd better push it forward instead. The ladder still breaks if we try to climb it (I came down through the other hole, so it was still intact.) But while we can't TAKE ROPE from atop the cask, we can CUT ROPE WITH SWORD, allowing its end to fall within reach. CLIMB ROPE is a challenge with a load of equipment. We can drop most of the stuff and climb up, but as we ascend back to the boat, the airhose trailing behind tears again?!? EXAMINE AIRHOSE along the way doesn't show any damage or snagging. Could our compatriots above be cutting the line? Maybe I should not pull the line until later, I ought to find the line again when I get up to the ship. Nope, that doesn't work either, the line is still getting torn along the way. What am I doing wrong here? I shouldn't be running out of air from the compressor yet. PULL HOSE (my attempt to reel it in) yields a puzzling response: I don't juggle objects! D'oh!!! I entered the boat the other way, at the aft end where we can't climb up again -- so I've looped the airhose through the vessel and am breaking it as I try to swim back up. I wish there was a way to observe the hose's behavior in more detail, so this wouldn't be so mysterious, but I suspect that would have been very complex to code. So it's back to an earlier save to come down the ladder-breaking route when I enter the Sao Vera. Now I can make it back to the boat -- and the maple chest I selected is full of old Portuguese newspapers. Another try, bringing up the oak chest this time... and it's full of gold escudos! But I am exhausted, and when I sleep, my throat is cut by one of our gang! Keeping the sword for the return swim does not seem to help. And DIAGNOSE before we start the ascent to the surface indicates we are not hungry, not thirsty, and wide-awake. And this appears to stay true all the way up. Hmmmm. So how we keep ourselves from falling asleep? Or could we have ferreted out a traitor earlier in the story? The envelope found in McGinty's office while he steps out reads, "Weasel's Merchant Seaman's Card - collateral for deal" in McGinty's handwriting. Looks suspicious to me. Showing Johnny the envelope before we depart gets Johnny to say he'll "take care of him." But in a short while, he returns to say, "I've taken care of the Weasel, but we can't go without a crew. Maybe next time." So maybe I am doing this too early. If we have the envelope in hand as the rest of the crew begins arriving, though, the Weasel kills us -- "That's one of McGinty's envelopes! Traitor!" So are we falsely accusing him? I guess we'll find out if our throat still gets cut at the end after getting him out of the way. We need to hide the envelope and show it to Johnny after we're at sea -- we can HIDE ENVELOPE UNDER BUNK before going to sleep. In the morning, we can retrieve the envelope -- though we still need to avoid the Weasel, who's hanging out on the Aft Deck, and see Johnny (visiting Pete is okay, he confirms the card is the Weasel's.) We can find Johnny in the Captain's Cabin, and he promises to take care of the Weasel; since we're already at sea, there doesn't seem to be any concern about crewing the boat. Since I'm replaying anyway, this time I'll take the small machine from the storage room, though I suspect that some of these items are only needed for the alternate S.S. Leviathan scenario. It does click faster near the oak chest, so that confirms this hasn't been re-randomized. This time we get safely back on board, with our remaining, trustworthy crew at hand. (No information is provided about exactly how Johnny took care of the Weasel, and perhaps it's best that we not know.) A tear is shed for the late Hevlin, and we're rich! Rich! I didn't play through the alternate scenario -- it's not a choice made by the player, so only one case will randomly apply in any given playthrough. But research indicates that the it's a shallow dive, involving the salvage of some rare stamps from the S.S. Leviathan where mines must be demagnetized, a lock drilled, and a stamp case resealed in an air pocket using the waterproof putty. Cutthroats is a bit misleading, titlewise, as other than Weasel and McGinty we never actually deal with any villainous or explicitly piratical types. And the game marches us along a fairy fixed schedule -- while there's some interesting storytelling going on, and many possible situations are appropriately handled, the plot's time pressure means we can't explore the game's world very thoroughly and win at the same time. It's a shame that the intended replay value is so much out of the player's hands -- since we don't know which scenario is in effect until we get to the 9:30 meeting at the lighthouse, we have to go through the motions for a while just to see if we're getting a crack at the second path. I would wager that most honest players, fighting through without benefit of walkthroughs or guides, never know there is an alternate scenario; it just appears that the other wreck is a red herring, not a separate playable situation. I've been meaning to play Sorceror, sequel to Enchanter, and perhaps I should tackle that one next time the Infocom bug bites.